The latest series of Spawn - 22, to be exact - is now hitting the shelves. This set of figures is called 'The Viking Years', and consists of Bloodaxe, Skullsplitter (reviewed here), Valkerie (the required chick), Bluetooth, Beserker the Troll, and Dark Raider. Very similar to the Samurai Wars series (19), these figures will fit very well on the shelf together. There's a deluxe figure of Bloodaxe mounted on his horse, Thunderhoof, that hasn't been released yet. These are going for the usual ten bucks or so at major retailers, although the smaller ones may be at $13. That's what I paid for Skullsplitter at a local Software Etc. 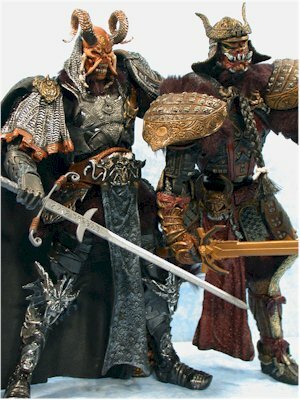 McFarlane Toys has developed aback story here - Eric (Bloodaxe) and Jorvak (Skullsplitter) don't like each other. Why? Well, a woman of course! Seems one stole a lady from the other, yadda, yadda, yadda, and now they battle through eternity. The clamshell packages are really growing on me. The inserts have a ton of color, and when you open it up you can see great images of Tortured Souls 2, along with several other lines. It's definitely able to withstand lots of shelf wear as well, and you won't have to worry if you have to pack it away for the time being due to a shortage of shelf room at home. 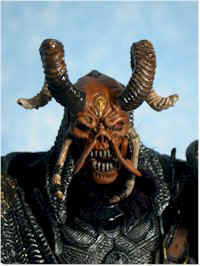 Of course, it's not particularly collector friendly, but it works well for those that like to keep their figures MOMC. Once again, the sculpts on this entire line, and Skullsplitter in particular, are amazing. The level of detail and attention is still well above any other company in this scale. Not every Spawn series is a winner, and I was less than impressed by things like Nitro Riders and Interlink. Still, when McToys comes back to complex character designs with lots of detail, they have a winner every time. 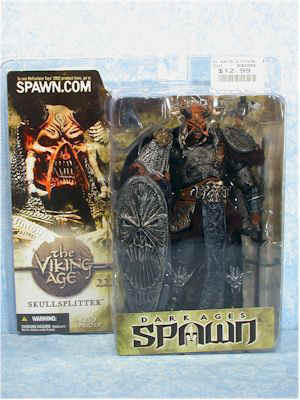 No complaints here, at least on this Skullsplitter, and on the rest of the wave I saw on the shelf. All the ops were very clean, and with the level of detail required that's a real plus. I'm not sure I like the black/silver wash on this arm as much as the previous Samurai Wars color scheme, but it's not because it's poorly done. There's lots of comparison between Samurai Spawn and Skullsplitter when it comes to articulation. They both have the same very cool double ball jointed shoulders, with tons of other joints to go around. Skullsplitter has a ball jointed neck, the aforementioned shoulders, cut elbows, cut wrists, ball jointed waist and hips, knees and ankles. There's very few poses you won't be able to put him in, and the only flaw I found is that his cape tends to get in the way of some of the more outlandish poses. Having it removable would have helped this situation. My only complaint with the articulation overall is that it wasn't as well hidden as Samurai Spawn. The shoulder pad on the left shoulder tends to ride very high, and in many positions the double ball jointed should was completely exposed. But that's a fairly small quibble with so well articulated a figure. Here's a special category just for McToys. This continues to be an issue for them, and I popped the shoulder pad off Skullsplitter accidentally within about 3 minutes of having him out of the package. Nothing a little glue can't fix, but I prefer when my toys stay together a little longer. The joints were all tight, and I was particularly pleased with the sturdy posts used for the swappable hands. You aren't likely to have much trouble with them, and they are thick enough not to break easily. There's three - an extra set of hands, a shield and his sword. The sword is excellent, made from a nice sturdy plastic, unlikely to get the drooping disease. It's an excellent sculpt, although overall I like Samurai Spawn's weapon a little more. The shield is extremely well sculpted, and fits nicely in the standard left hand, although in certain positions he had a tendency to drop it. There's a matching motif with his armor, so that he is not just a Viking, but a stylish Viking. I'll assume you pick these up for $10, which is a reasonable price. I'd prefer $8, which I think is far more in line, but considering the quality of the sculpt and the level these are above the competition, I'll cut them some slack. However, paying $13 or more is over the top, and you can take off a half star or so if you get stuck like I did. 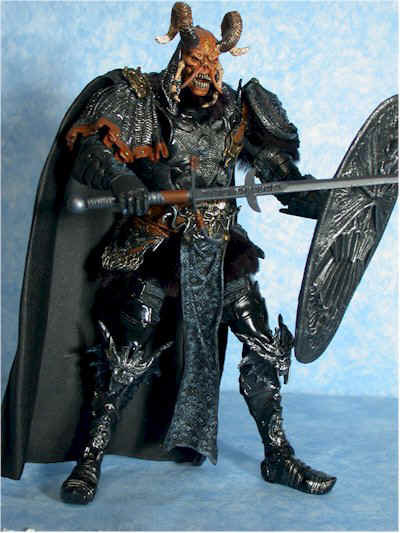 The only thing stopping this from being a four star figure was the inflated price and the slight problems with the shoulder pad. Actually, from what I saw of the wave, the entire series is quite well done, and is certainly worth a hard look. 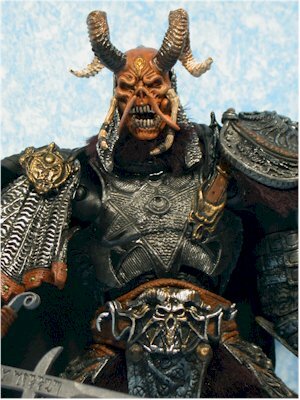 I suspect Skullsplitter and perhaps Bloodaxe will be in the running for best male figure of the year in the People's Choice awards. - a reader pointed out a new store to me: Toynk. They have pretty good prices on things, with the set of six Spawn 22 figures at $56, plus $5 shipping. With tax, that's less than the $10 each you'll be paying at your local store. I have never ordered from them myself though. - Aisle Sniper has the case for $103, but you can also buy individual figures for $10 each, plus shipping. They still show as a pre-order, but I'm betting they have them in or will very soon.